Garlic mustard (Alliaria petiolata) is among the most invasive plant species. While hiking through woods and wetlands, some nature-lovers are compromising the “unspoiled” places they enjoy most. They don’t mean to, of course. But scores of invasive, non-native plant species have made us all unwitting participants in their spread. In North America, invasive plants like mint, English ivy, and Japanese honeysuckle escaped from the garden to permeate the understory of many natural, uncultivated areas. These herbaceous interlopers adapt quickly and flourish. As a result, native woodland plants, trees, and shrubs historically found at these sites have a much harder time becoming well-established. This, in turn, disrupts the natural food web, negatively affecting the animals and insects surviving on these native plant species. Many other invasive plants were originally introduced by European settlers. Brought to North America in the 1800s, the biennial troublemaker known as garlic mustard (Alliaria petiolata) is among the worst of these. Once grown as an edible and medicinal herb, it has since gone rogue. As invasive plants go, garlic mustard really gets around. It persists in a myriad of habitats and outcompetes nearly everything around it. When flowering, individual garlic mustard plants develop clusters of tightly packed florets which can produce hundreds of seeds. 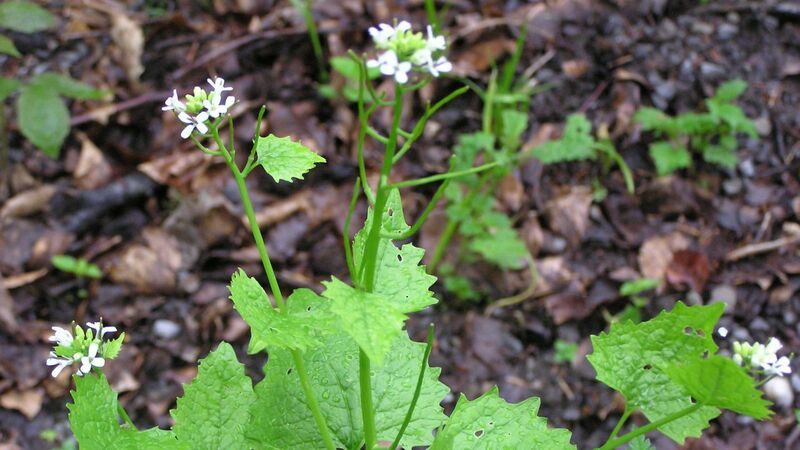 In fact, dense garlic mustard populations can release more than 100,000 seeds in just over 10 square feet. What’s more, a single seed can bide its time in the soil for up to five years. Small and lightweight, garlic mustard seeds also love to travel. They easily stick in the tread of bike tires and, yes, your hiking boots. Like to visit lots of different forested areas? You could be inadvertently spreading garlic mustard—and other invasive plant species—to every new site you hit. Fortunately, there’s an easy fix. Rather than hang up your hiking boots for good, you need only keep them very clean. Now merely wiping off “the worst” of the dirt and mud simply won’t do. (After all, it only takes a single stray seed to start a cascade of ill effects in an otherwise unspoiled area.) To do the job right, I use a horse pick—a small, metal tool made for cleaning horse hooves—to scrape soil, seeds, and other detritus from the bottoms of my shoes before and after every nature hike. (Some horse picks also include bristled brushes on one end which can be handy.) I am also especially careful to clean my boots between different sets of woods and nature preserves since one might have more invasives—not to mention different types of invasives—than another. Don’t have a horse pick? A small, flathead screwdriver works well, too. No matter what you choose, keep one tool in your car and another in your purse or backpack, so you’ll remember to use them. Painstakingly de-seeding your shoes (and your bike tires and Fido’s feet…) before and after forest forays may seem like a nuisance. But helping to keep natural areas from becoming even more overrun with invasives? That’s worth making the process of cleaning your treads simply second nature.